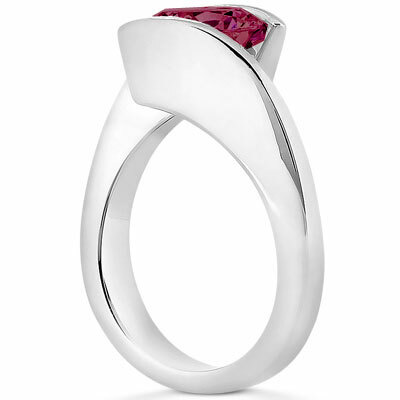 A ruby is undeniably glamorous and when it's placed in a contemporary tension setting crafted from 14K white gold, it's indisputably modern as well! This tension set ruby engagement ring hugs a striking 6.5mm round ruby with two arms of 14K white gold that curve elegantly as they emerge from the simple, shining band. This piece perfectly pairs the sophistication of the classic red precious gemstone with simple yet striking shapes for an up-to-the minute look that won't be ignored. 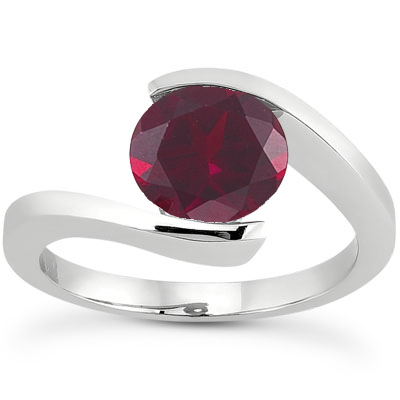 A 6.5mm ruby is tension set into a 14K white gold setting. We guarantee our Tension Set Ruby Engagement Ring to be high quality, authentic jewelry, as described above.